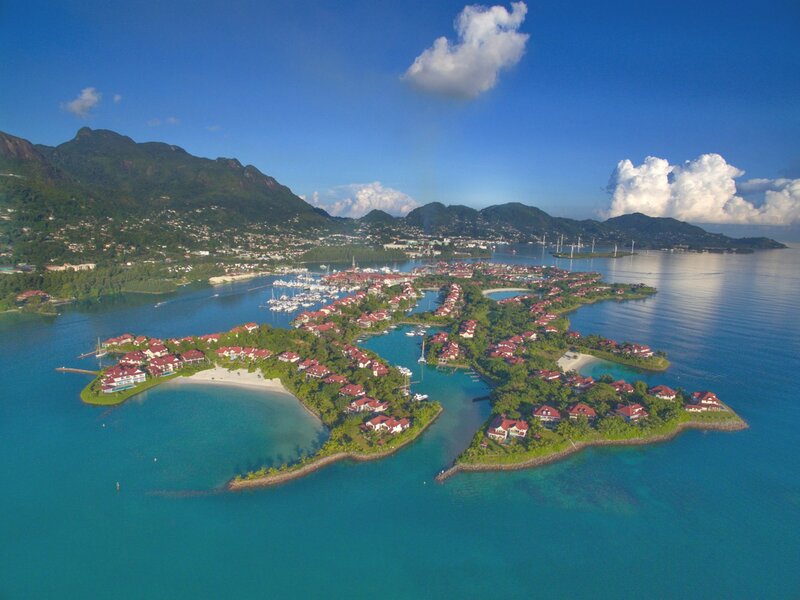 Eden Island in the Seychelles archipelago the perfect home away from home for sailing and fishing enthusiasts. Situated outside the cyclone belt and blessed with moderate swells and tides, Eden Island offers favourable year-round conditions for cruising yachts and leisure craft. A yachting vacation can yield opportunities for water sports and activities such as fishing, diving, snorkelling or kayaking. For those who wish to invest in this outdoor living experience, Eden Island is a unique luxury residential property concept as each waterfront property on Eden Island comes with a mooring that will also be conveniently maintained when you’re not there. As members of the Village Management Association, homeowners have their moorings (boardwalk, pontoon, bollard) cleaned, maintained and even insured by paying an initial once-off fee followed by a monthly charge added to their levies. The well-equipped Eden Island Marina is located on the sheltered south-western shore of Eden Island and can cater for super yachts of up to 100m in length. This means you can enjoy the many sailing events while living in the lap of luxury. The Seychelles archipelago lies between 4° and 10° south of the Equator where you have 1.4 million square kilometres of ocean to navigate in the 115 islands you can choose from on your sailing escapades. The Inner Island group has 41 granitic islands which are found around the 3 main islands of Mahe (there are safe anchorages and over 65 beaches), Praslin and La Digue, as well as 2 coralline islands, Denis Island and Bird Island (home to amazing colony of sea birds and Esmeralda, the world’s heaviest tortoise at 298 kilos). The most popular and breath-taking Reserves and Marine Parks are: Cousin, Aride, Curieuse Marine National Park, Ste. Anne Marine National Park, Ile Coco Marine National Park, St. Pierre. The Marine Parks have specified zones marked for visitors and Marine Park rangers will visit your yacht to collect the fees for landing, entry or overnight mooring. Landing access to private islands (Bird, Chauvre Souris, Anonyme, Cousine, Denis,Felicite, D’Arros and St. Joseph Atoll, Fregate, Grand Soeur, Moyenne, North, Petite Soeur,Round Island near Mahe, Round Island near Praslin) is only granted by permission of the owners. If you are searching for the Robinson Crusoe experience, then head for the Outer Islands Group, a group of 72 coralline islands in the southernmost part of the 1.3 million square kilometre Seychelles Exclusive Economic Zone, between 130 miles and 630 miles from Mahé, and between 260 and 865 miles from the east coast of Africa. There are 6 groups within the Outer Islands; the Amirantes, the Alphonse Group, the Southern Coral Group, the Farquhar Group and Aldabra (UNESCO World Heritage Site, home to the 150,000 giant tortoises). If you plan to visit the Outer Islands, then your yacht needs to have specifications in the over 60 miles class, and they need to have a captain and crew. If you wish to land on the islands of Alphonse Island, Coetivy, Bijoutier, Desroches, Poivre Atoll, Platt, Farquhar, Providence Atoll, Silhouette, Remire, St. Francois, then you need to obtain permission from the state-owned Islands Development Company, which manages the islands. If you don’t own a boat, then there are more than 30 boat charter companies on Mahé Island, offering bare boat, crewed boat and day charters for a safe and relaxed cruise around the islands. You have a choice of traditional sailing vessels as well as modern yachts and boats, with options to taking snorkelling stops and go diving. Eden Island has several boat charter companies based in its Eden Plaza and Boardwalk area that can help you to make the best choice.